Sorry Biryani, Pakistan Likes Pizza! This Post has already been read 873 times. Pizza comes back with a revenge to take down Tikka and Biryani in the capital cities of Pakistan. Previous year’s champ of the most ordered cuisines from EatOye, www.eatoye.pk/ Tikka has lost the title to current year’s emerging star Pizza. We are back with the semi-annual comparison of the best dishes ordered through EatOye. EatOye’s hyper discounts, mainly offered on Pizza deals are one of the drivers for recent growth in pizza orders. Secondly, it is because the pizza segment is matching customers’ needs for quality, freshness and the ability to choose from a broader selection of restaurants. Pizza is not only one of Pakistan’s favorite foods, it’s also trendy. Ordering trend at EatOye shows that consumers eat pizzas more than three times per month and new outlets opening around key cities are giving consumers choices beyond traditional pizza options to satisfy their cravings. The debate, on which dish is better, can go on forever. However, when you consider the total orders till May 2015 from EatOye, Pizza has a dominating share of 28% and is the most ordered dish for the current year. Last year’s winner Tikka, has stooped down the list as it is currently placed at number 2 with a 26% share. The third position in the list is held by none other than a Pakistani favorite, Biryani with a share of 23%. When the dishes go head to head in terms of growth in orders, Pizza comes on top with a remarkable growth of 7% in its share and has gone up from 21% to 28% of the total orders. 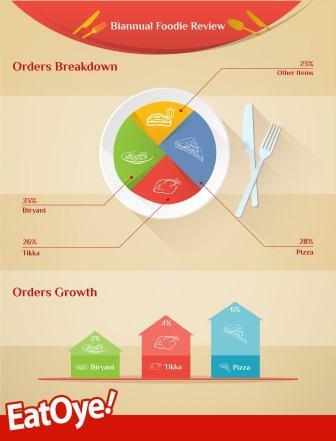 Biryani orders saw growth by a small margin 2% in their share and have moved up from 21% to 23% share in total orders. The total orders for Tikka have grown by a margin of 4%, in 2014 Tikka had a share of 22% in the year 2014 and in 2015 till date the share is 26%, This means that the order share of each of these dishes has grown. Nevertheless, this is not the end of the ‘dish comparison story 2015’. You got to stay tuned till end of this year to see if Tikka bounces back to take the top position or Biryani sneaks its way to the top. EatOye is becoming an amazing database for food, currently there are 8000+ menu items listed for different restaurants. Imagine if you were to order one item every day, it would take you close to 22 years to taste every item!